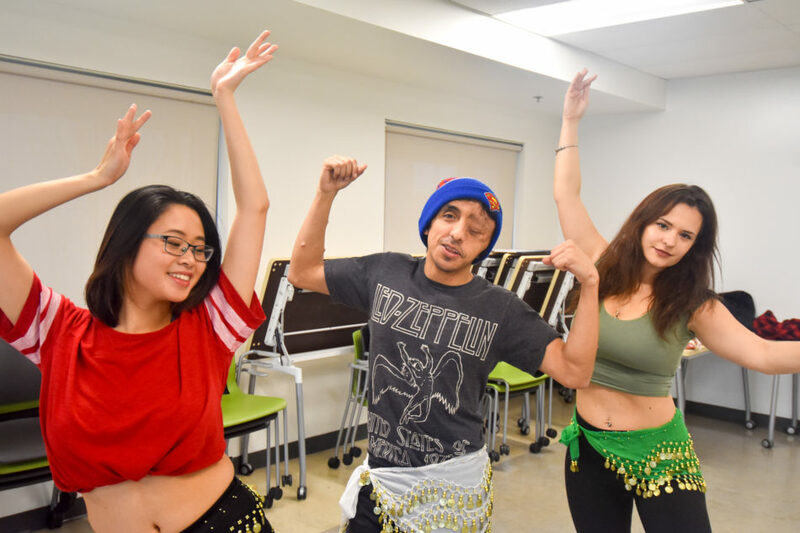 Victoria Kalitowski, a full-time science student and a science and horticulture representative for the Kwantlen Student Association, has brought one of her passions to KPU in the form of a new belly dancing class being held on the Surrey campus. The class, which takes place on Thursdays in Birch 250, offers a “free and relaxed” atmosphere for students, staff, and faculty to enjoy, according to Kalitowski. “It’s a nice break to have time to kind of relax and dance a little bit and de-stress,” she says, adding that the stylistic fluidity of belly dancing allows for plenty of freedom of expression. Kalitowski has admired belly dancing ever since she was in high school, when she saw a friend of hers perform a routine at a talent show. As a representative with the KSA, she noticed a distinct lack of dance classes being offered at KPU, so she decided to start one of her own. Despite years of practicing the art form, this is her first time leading a belly dancing class. Kalitowski hopes that people who join in can gain confidence from learning how to belly dance just as she did. Passers-by will likely take notice of the class due to its fun and engaging atmosphere. Though there were only three participants at the Nov. 15 session, it was hard not to get swept away in joy and camaraderie as the students followed Kalitowski through each of the routines. One of the dancers—Kat Su, who was attending for the first time—says she is glad that the class is taught by a fellow student. “When its a peer, then its a lot more fun. You can easily enjoy yourself and you feel way less intimidated,” she says. Kalitowski says that, because the class has only been offered for a few weeks so far, very few students know about it. She hopes that word of mouth will spread quickly, and that anyone at KPU who is interested in getting involved will stop by to check out the belly dancing classes for themselves.